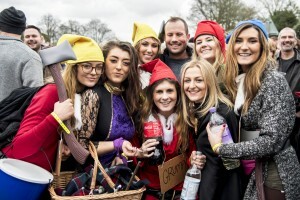 » Headlines » Boxing Day in Windlesham packs a real wallop! Boxing Day in Windlesham packs a real wallop! WHAT do boisterous Bavarians, a clutch of clucking chickens and a posse of pirates have in common? 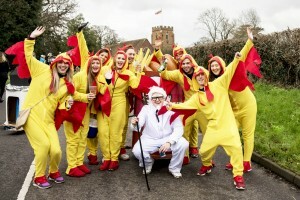 It may sound like a corny Christmas joke left over from a dinner table cracker but the answer is in fact Windlesham: more specifically the village’s Boxing Day Pram Race. 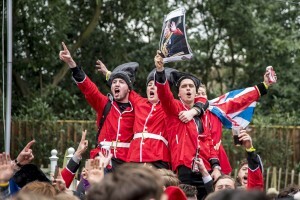 Held annually to drum up winter funds for a host of good causes, the fancy dress event takes entrants on a 3.5-mile reccy to a number of local pubs before prizes are dished out for the best dressed team; the most imaginative ‘pram’; and the fastest float. Picking up the accolade for best dressed on the day was the squadron from Woking Aviators Scout Network, who dazzled judges with their homemade biplane – crafted in honour of their passion for the skies. The post-Christmas Day caper began at Highams Hall on Chertsey Road and finished at The Windlesham Club & Theatre in Kennel Lane. En route, racers visited The Brickmakers Arms, The Surrey Cricketers, The Sun, The Half Moon, and The Bee pubs. Rolling road closures and start times ensured the hundreds of revellers, who help the colourful Boxing Day festivities pack a mighty punch, did not disturb too many locals who prefer to take December 26 at a more leisurely pace. Just some of the famous faces to hit the streets on Saturday morning were the Colonel and a coop of chickens; the Thunderbirds team with near-lifesize Thunderbird 2 transporter; Snow White’s dwarven friends; and the unmistakable Teletubbies. There was also nothing foolish about one team’s tribute to Only Fools & Horses, while a ‘Crate Escape’ contingent of beer bottles showed their intentions for the day in their costumes. A stable of unicorn riders, a pram urging America not to vote for Trump in the upcoming election, fortune tellers, runners dressed as Christmas presents, Santa and his entourage, a fried breakfast team, and a slightly off-colour salute to Star Wars all featured at the weekend.